This is a mod designed to help mod pack makers resolve potion id conflicts. 1. Tracks all potions as they are added to the potions array. 2. Finds all conflicting id's. 3. Finds all available id's. Potion Id Sorter has found 5 potion id conflicts. The first potion is the one that has been overwritten. The second is the potion currently assigned to the id. This mod has already found all of the available potion id's and assigned one to each conflict. 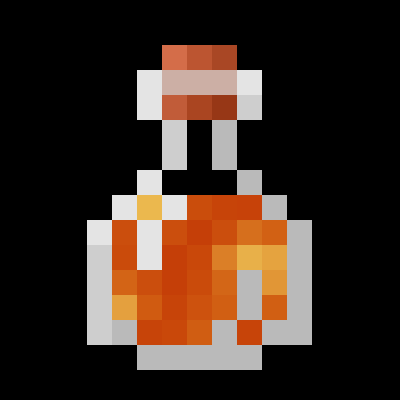 Simply change one of the conflicting potions to the id suggested in the config for the mod that adds the potion. The mod id is not given but it should be easy to figure out the mod from the class. Just look for the mod name in the class path e.g. "am2.buffs.ArsMagicaPotion" = Ars Magica, "vazkii.botania.common.brew.potion.PotionSoulCross" = Botania, "com.emoniph.witchery.brewing.potions.PotionChilled" = Witchery etc. This file is generated in the config folder. Once you have resolved all of the conflicts it is recommended that you remove the mod (Unless you need more then 127 potion id's) because the asm used to extend the potion array past 127 breaks compatibility with vanilla servers. Delete any old versions of PotionIDHelper and BrandonsCore.jar files from your ".minecraft/mods" folder. Download and drop both PotionIDHelper and BrandonsCore.jar files into your ".minecraft/mods" folder. can this work on a server to allow more potion IDs? I assume so, right? can you port it to 1.12.2? Would be nice to have something similar for Enchant IDs. The only thing I found is to throw away some mods with enchants, then load a world and use NEI's dump feature, then configure the other mods accordingly, which is inconveinent. I just wanted you to know that I LOVE this mod, saves me hours of tedium and searching to make sure all these are accounted for. Enchantment ID's force a crash when they conflict, but would it be possible to make a similar mod for Biome ID's? BOP and ATG together make for pretty monstrous list, and something like this would be great. There's a mod for that on CurseForge. Biome ID something.